While my race in Muskoka did not go as planned it certainly made for excellent mental toughness training! Lisa Bentley and her crew put on a super event in one of my favorite race venues–many thanks to them all for putting this on! The women’s pro field, while small, was stacked with very talented and some very experienced women who tackled the tough course with poise. Way to go Amanda and Michael Lovato who captured the titles from world champs Craig Alexander and Mirinda Carfrae who took 1st the last few years. It was pretty exceptional to see a husband and wife team win! A super shout out to the gutsy Fiona Whitby who raced fresh off the heals of a 5th place finish at Ironman Canada. That was an impressive effort. Also, our very own Mike G rocked the course, posting the fastest age group time of the day! I should point out that he did so while looking totally (and unfairly) relaxed as he passed me on the hill at Grandview. Seriously–he looked fantastic out there. For my part the race started out very well with a swim that had me out of the water in 2nd place. I swam alone for the entire 2k. Much as I usually like feet to swim on, it was ok not to have them since I know the lake well and felt quite at home. I was also solo for most of the ride…as in I couldn’t even see anyone. This made mental focus key and I struggled a little with that when I thought about the upcoming run. Typically I can’t wait to get to the run, but I had some foot/ankle issues going on coming into the race and I was a more than a little anxious about them. Prior to the race I tried my very best not to pay too much attention to the discomfort hoping it would minimize the swelling etc. I came off the bike in 4th place with 3rd place 3 minutes ahead of me. I tried to reel her in, but the rolling course was hammering my foot. I closed the gap on her to 37 secs but then just couldn’t hold the pace or hold off the pain shooting from my foot to my shin. (I’m awaiting bone scane and xray results) I ended up in 5th place and really learned a lot out there about how to keep on keeping on when I really wanted to call it a day. The spectators were super vocal coming back to Deerhurst–one of the benefits of a local race where so many people you know can get out to watch! Their cheers were so helpful. 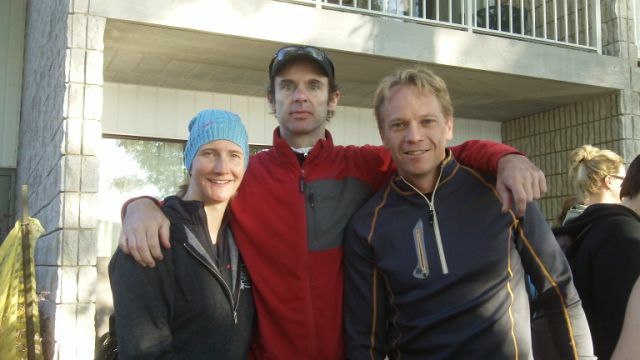 My super coach Tara Norton did a relay together with Darko Ficko (who posted the fastest bike split by far in windy conditions–riding 2:18 over a hilly and arduous 94km) and our friend Todd Ross. They came in second. 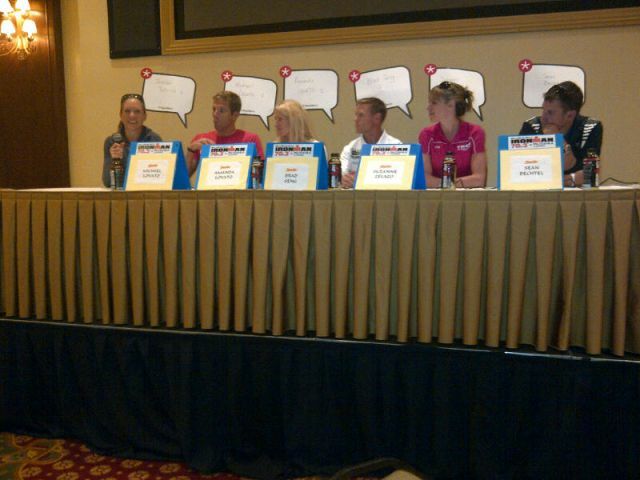 Here’s a pic of them as well as one of me at the pro press conference before the race!